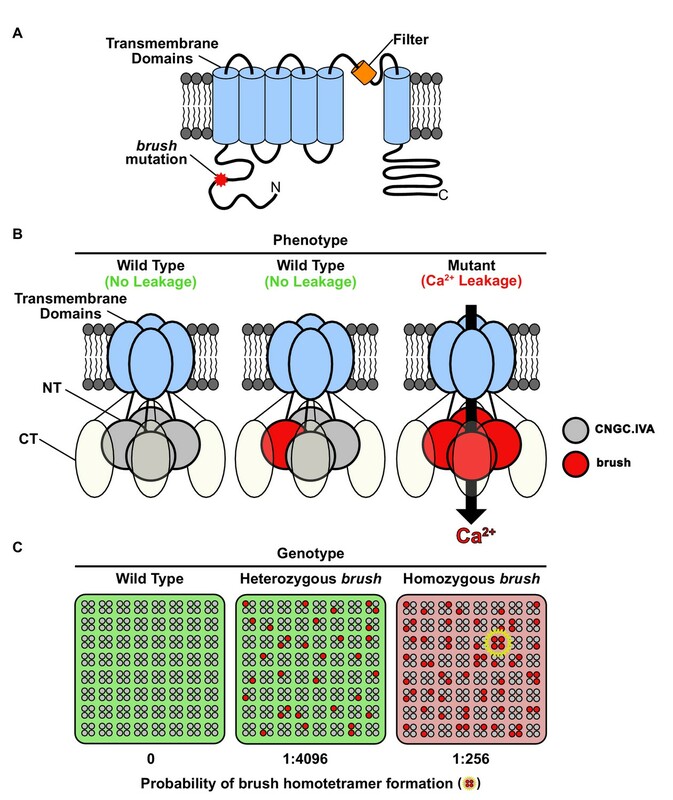 The coordinated control of Ca2+ signaling is essential for development in eukaryotes. Cyclic nucleotide-gated channel (CNGC) family members mediate Ca2+ influx from cellular stores in plants (Charpentier et al., 2016; Gao et al., 2016; Frietsch et al., 2007; Urquhart et al., 2007). Here, we report the unusual genetic behavior of a quantitative gain-of-function CNGC mutation (brush) in Lotus japonicus resulting in a leaky tetrameric channel. brush resides in a cluster of redundant CNGCs encoding subunits which resemble metazoan voltage-gated potassium (Kv1-Kv4) channels in assembly and gating properties. The recessive mongenic brush mutation impaired root development and infection by nitrogen-fixing rhizobia. The brush allele exhibited quantitative behavior since overexpression of the cluster subunits was required to suppress the brush phenotype. The results reveal a mechanism by which quantitative competition between channel subunits for tetramer assembly can impact the phenotype of the mutation carrier. Plants constantly monitor and respond to changes in their environment. Central to this surveillance system is the movement of calcium ions into and out of cells. Calcium ions are normally kept at very low levels inside of cells and subtle changes in these levels relay information about the external environment. In the case of plant roots, changes in the concentration of calcium ions herald essential information about soil conditions and the presence of microorganisms, and in turn trigger appropriate responses. Calcium ion signals are essential for peas, beans and other members of the legume family to form close relationships (known as symbioses) with soil bacteria called rhizobia. As such, many studies of calcium signalling have focused on root symbioses, particularly in a model legume called Lotus japonicus. Previous studies have identified one mutant version of this plant, called brush, which develops abnormal roots with brush-like arrays of root hairs near the tip. The brush mutant was also unable to form a symbiosis with rhizobia, and structures that allow the bacteria to enter the plant stopped developing before they were complete. However, the gene responsible had not been identified. Chiasson, Haage et al. set out to identify the responsible mutation. At first the brush mutation escaped identification because a key experiment gave an unexpected result. The introduction of a normal, or wild type, copy of the proposed gene – referred to as BRUSH – into the brush mutant did not correct the problems with its roots. Further analysis revealed that it was actually the ratio between BRUSH and brush expression levels that was critical for determining how the plant’s roots developed. The mutation in brush causes a small change in a protein belonging to the CNGC family. These proteins act as channels and allow ions to move across cell membranes. Further experiments found that the channel formed by the mutated CNGC protein is leaky and allows calcium ions to enter the cell in the absence of any cue from the environment. The leaky entry of calcium ions likely confuses the plant’s surveillance system, which disturbs the normal development of the root. It is also likely that the brush mutation’s effects on calcium signaling also interfere with the entry of rhizobia into the roots. These findings provide important insights into the function of CNGCs and reveal how a small change in a channel protein can have far reaching effects on an organism. The legume-rhizobium symbiosis offers an excellent model system to study the role of Ca2+ signaling in eukaryotic cell development. Rhizobia produce lipochitooligosaccharides (LCOs) which stimulate signal transduction processes involving not only oscillations of [Ca2+] in the nucleus and perinuclear region but also rapid influx of calcium ions into the cytoplasm of legume root hairs (Felle et al., 1999; Cardenas et al., 1999; Ehrhardt et al., 1996; Harris et al., 2003; Miwa et al., 2006), preceeding rhizobial entry and organ development. The Lotus japonicus mutant brush was previously isolated in a screen of an ethyl-methanesulfonate (EMS)-mutagenised population for plants defective in symbiotic cell development (Maekawa-Yoshikawa et al., 2009). At 26°C, brush roots are stunted and root hair infection threads do not progress into the root cortex, resulting in the formation of non-infected (‘empty’) nodules. The evidence suggested that the recessive mutation was negatively interfering with infection thread progression and cell expansion in the root apical meristem. The brush mutation was mapped to the short arm of chromosome 2 at 8.8 cM (Maekawa-Yoshikawa et al., 2009), linked to the marker TM0312. Subsequently, a large-scale recombinant screen for fine-mapping was undertaken. In total, 20 of 1148 tested F2 individuals showed recombination events between the flanking markers TM2432 and TM0348 (Figure 1—figure supplement 1). F2 genotyping and subsequent F3 phenotyping refined the target region to 37 kb. One EMS-induced mutation was detected in the first exon of BRUSH, a predicted CNGC of unknown function. Because the brush mutant phenotype could not be complemented with the genomic region containing BRUSH including its native promoter (see below), we searched for additional possible missed mutations. The genome of brush was sequenced and aligned with the reference genome. Within the already delineated target interval the mutation in BRUSH was confirmed and no additional polymorphisms relative to the Gifu wild-type were detected. The predicted genomic sequence of BRUSH carried a guanine to adenine (G401A) transition in the first exon in brush (Figure 1A). Amplification of brush cDNA revealed an open-reading frame encoding a protein containing 773 amino acids with an amino acid exchange from glycine to glutamic acid (G134E). The genome of the model plant Arabidopsis thaliana contains 20 predicted CNGC genes, which can be classified into four distinct groups (I, II, III, IV) (Mäser et al., 2001). 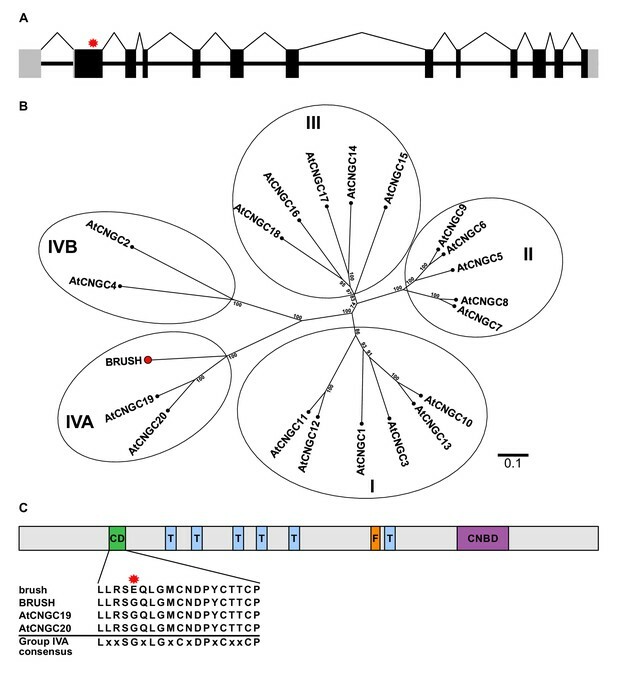 Phylogenetic and synteny analysis revealed that BRUSH (CNGC.IVA1) is orthologous to the Group IVA members AtCNGC19 and AtCNGC20 (Figure 1B). Similar to other Group IVA CNGCs, BRUSH contains a relatively long N-terminal extension followed by six predicted transmembrane domains and a cyclic nucleotide-binding domain (Figure 1C). The brush mutation is located in a conserved region previously identified as a putative sorting signal in Group IVA CNGCs (Yuen and Christopher, 2013). Sequencing coupled with gene prediction of the brush target region revealed that BRUSH resides in a cluster containing five CNGC loci (Figure 1—figure supplement 2). Analysis of syntenic genomic regions in legumes and non-legumes revealed that the CNGC.IVA cluster expansion occurred early in the legume lineage and was retained. Transcripts for three of the loci could be amplified (CNGC.IVA3, CNGC.IVA4, CNGC.IVA5) and encode proteins which are closely related to BRUSH (Figure 1—figure supplement 3). No transcript was detected for CNGC.IVA2 which contains a large transposon insertion in the seventh intron (Figure 2A). brush contains a point mutation in CNGC.IVA1 (BRUSH). (A) Schematic of the intron-exon structure of BRUSH highlighting the brush mutation in the first exon (red asterisk). (B) Phylogenetic tree of BRUSH (red node end) in relation to Arabidopsis thaliana CNGC proteins. BRUSH is orthologous to the Group IVA members AtCNGC19 and AtCNGC20. (C) Overview of the BRUSH protein domain structure highlighting the conserved Group IVA domain (CD, green), transmembrane domains (T, light blue), putative filter region (F, orange), and the predicted cyclic nucleotide-binding domain (CNBD, purple). Shown below is the CD sequence in brush (G134E mutation, asterisk) relative to BRUSH, AtCNGC19, and AtCNGC20 and the Group IVA CNGC consensus (Yuen and Christopher, 2013). Numbers at the branch points in (B) indicate the percentage bootstrap values (100 iterations) for the inferred tree. Scale bar in (B) indicates the number of amino acid substitutions per site. (A) Genomic region surrounding BRUSH on L. japonicus chromosome 2 showing a cluster of five CNGC.IVA genes (red asterisk, brush causative mutation). CNGC.IVA2 contains a large transposon (Tn) insertion. CNGC.IVA2 contains a large transposon insertion (shown as a gap). (B) Complementation assay of brush roots by overexpression (ubiquitin promoter, UBQ) of the four expressed CNGC.IVA cluster members (bright field, top panel). The presence of red fluorescent nodules (arrow) colonized by Mesorhizobium loti expressing the red fluorescent protein DsRED (lower panel) indicates successful bacterial infection and thus complementation. (C) Number of nodules per transformed plant from (B) (n = 10 for all constructs). (D) Quantitative reverse-transcription PCR analysis of brush transcript levels after RNAi targeting either the 5'UTR or 3' UTR of brush. The normalized fold expression of brush is shown relative to empty vector control roots (n = 6 for all constructs). (E) Complementation analysis of brush expressing RNAi fragments targeting either the 5'UTR or 3'UTR of brush in the brush mutant. Panels are the same as (B). (F) Number of nodules per transformed plant (n = 10 for all constructs) from (E). Roots for both complementation experiments were observed 6 weeks after inoculation with rhizobia. Scale bars in (B) and (E) represent 1 mm. Letters in (C), (D), and (F) indicate different statistical groups (ANOVA followed by Tukey’s HSD test). F(4, 45)=10.86, p < 0.001 (C), F(2, 15)=20.82, p < 0.001 (D), F(2, 27)=22.72, p < 0.001 (F). To confirm that brush carried the causative mutation, the BRUSH genomic sequence was expressed in brush transgenic hairy roots driven by its native 2 kb promoter. Surprisingly, we did not observe rescue of either the root or infection thread phenotype (Figure 2—figure supplement 1A–C). However, when brush was transformed with the BRUSH genomic sequence driven by the L. japonicus constitutive polyubiquitin promoter, we observed restoration of the root and infection thread phenotypes, including infected nodules (Figure 2B,C and Figure 2—figure supplement 2A,B). These results suggested that expression level of brush is critical for phenotype manifestation. To further analyze the relationship between brush expression levels and the observed phenotypes, we generated RNA interference (RNAi) constructs to target the untranslated regions (3’UTR or 5’UTR) of the brush transcript in the brush mutant. Transformation of each RNAi construct specifically silenced brush (Figure 2D, Figure 2—figure supplement 3A) and restored rhizobial infection of root cells (Figure 2E,F). We then overexpressed the brush allele in wild-type Gifu hairy roots to recapitulate the brush phenotype and observed that ectopic overexpression of brush impaired hairy root emergence (Figure 2—figure supplement 3B). Collectively, these results suggest that the expression level of brush is critical for the observed phenotypes and that the phenotypic penetrance of the allele appears to be dosage-dependent. An EMS mutant (SL1484-1) was then obtained by TILLING (Perry et al., 2009; Perry et al., 2003) containing a point mutation (W119stop) early in the BRUSH open-reading frame. Analysis of homozygous mutant plants did not reveal any phenotypic root or infection abnormalities after inoculation with rhizobia (Figure 2—figure supplement 3C). The finding that the null mutant of BRUSH is not recapitulating the brush phenotype indicates that brush is an interfering allele and that the loss of BRUSH is compensated by potential redundancy of other CNGCs within the cluster. To determine if the other CNGC.IVA cluster genes are redundant with respect to BRUSH, we overexpressed CNGC.IVA3, CNGC.IVA4, CNGC.IVA5 in the brush mutant by hairy root transformation. Analysis of transgenic roots revealed that expression of each gene complemented brush, as evidenced by colonized root nodules (Figure 2B,C). 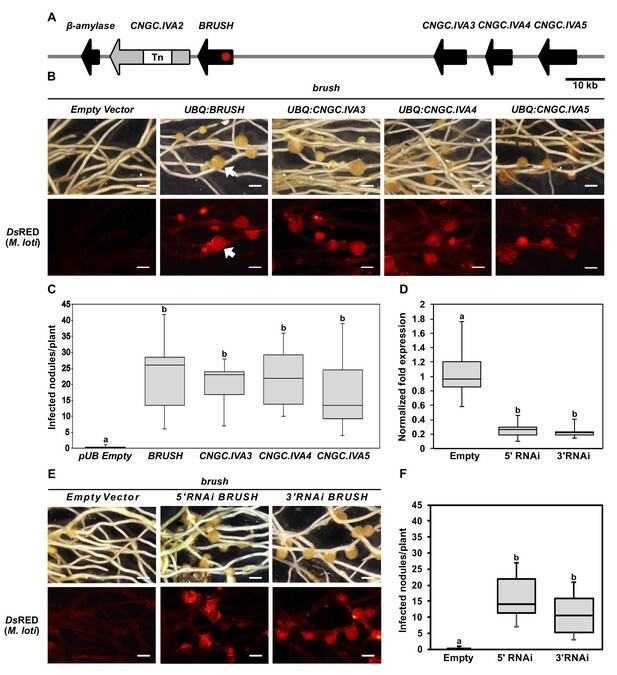 Further, we found that overexpression of the predicted Arabidopsis orthologs AtCNGC19, or AtCNGC20 in brush also restored nodulation (Figure 2—figure supplement 4A,B). To assess if each L. japonicus gene is expressed in roots, RT-qPCR was performed before and after inoculation with rhizobia. Transcripts were detected for BRUSH, CNGC.IVA3, CNGC.IVA4, and CNGC.IVA5, the levels of which did not show significant changes (<2 fold) after inoculation with the rhizobial symbiont (Figure 2—figure supplement 5A). Spatial expression analysis of promoter:β-glucuronidase (GUS) fusions revealed BRUSH expression in root hairs and developing nodules after inoculation with rhizobia and that CNGC.IVA3, CNGC.IVA4, and CNGC.IVA5 are expressed in similar domains (Figure 2—figure supplement 5B). Closer investigation of the BRUSHpromoter:GUS activity revealed a lack of expression in roots prior to inoculation and subsequent activity associated with infected root hairs and nodule primordia after inoculation (Figure 2—figure supplement 6). The overlapping expression pattern of the Group IVA CNGCs together with their ability to dampen the brush phenotype indicate that these genes are redundant. Given that plant CNGCs are anticipated to form both homomeric and heteromeric tetramers (Ma and Berkowitz, 2011), an interaction between BRUSH and redundant CNGCs is conceivable. We initially utilized the yeast split-ubiquitin interaction assay to determine the location of the BRUSH termini (Xing et al., 2016). The assay utilizes the N-terminal (Nub) and C-terminal (Cub) fragments of yeast ubiquitin (Ubi4) (Stagljar et al., 1998). Reconstitution of ubiquitin in the cytoplasm leads to proteolytic release of Cub (fused to LexA-VP16) and activation of genetic reporters. We observed that BRUSH-Cub interacted with both NubI-BRUSH and BRUSH-NubI fusions demonstrating that both BRUSH termini are located in the cytoplasm (Figure 3—figure supplement 1). Since voltage-gated ion channel subunits interact via their soluble domains (Barros et al., 2012), we focused on the CNGC.IVA soluble termini for yeast two-hybrid interaction assays. We observed a self-interaction for the BRUSH N-terminus (NT) as well as interaction with the NTs of brush, CNGC.IVA3, CNGC.IVA4, CNGC.IVA5 (Figure 3A) along with AtCNGC19 and AtCNGC20 (Figure 2—figure supplement 4C). To further substantiate the interaction observed in yeast, we co-injected full-length subunits into Xenopus laevis oocytes for bimolecular fluorescence complementation (BiFC) assays. Expression of BRUSH-BRUSH, BRUSH-brush, and brush-brush combinations resulted in successful complementation (Figure 3—figure supplement 2A,B). The yeast and oocyte interaction assays demonstrate that CNGC.IVA channels potentially form homo- and hetero-complexes in vivo, which may be mediated in part by their NT domains. Interaction of CNGC.IVA N-termini in yeast and channel activity in Xenopus oocytes. (A) Yeast two-hybrid interaction of the soluble BRUSH N-terminus (NT) fused to the GAL4-binding domain (BD) and the NT of the indicated CNGC.IVA proteins fused to the GAL4 activation domain (AD). Yeast cells were resuspended in water (OD600= 0.5 and 0.05) and spotted onto -LW (leucine, tryptophan) and -LWAH (leucine, tryptophan, adenine, histidine) solid media. (B) Confocal fluorescence images of oocytes expressing either BRUSH-YFP or brush-YFP fusion proteins. (C) Plasma membrane currents of oocytes expressing BRUSH or brush in the presence of 30 mM CaCl2. Voltage steps ranged from +60 to −160 mV in 20 mV increments, starting from a holding potential of −40 mV. Dashed lines indicate 0 µA. (D) Current-voltage relations of oocytes injected with water or YFP (▲, n=15), BRUSH or BRUSH-YFP (▽, n=17), and brush or brush-YFP (●, n=26) . (E) Relative current-voltage relations for oocytes expressing brush and brush-YFP in the presence of 5 mM CaCl2 (◇ , n = 3), 15 mM CaCl2 (■, n = 3), and 30 mM CaCl2 (●, n = 6). Currents are shown relative to the current at −120 mV in the presence of 30 mM CaCl2. Data in (D) and (E) represent mean values ± standard deviations. Scale bars in images (B) represent 250 µm. To characterize their channel properties, we injected either BRUSH or brush into Xenopus oocytes for two-electrode voltage clamping. Expression was confirmed for both BRUSH-YFP and brush-YFP by confocal microscopy (Figure 3B,C). Oocytes expressing BRUSH (Figure 3B,D) or BRUSH-YFP (Figure 3—figure supplement 2C,E) failed to yield significant inward currents at negative voltages in the presence of up to 30 mM CaCl2. In contrast, under the same experimental conditions, oocytes expressing brush (Figure 3C,D) or brush-YFP (Figure 3—figure supplement 2D,E) produced voltage- and time-dependent inward currents at negative voltages. The currents were evident starting from 15 mM external CaCl2 and increased in a dose-dependent manner with the external CaCl2 concentration (Figure 3E). Exchange of Ca2+ as a charge carrier to K+ abolished the voltage-dependent inward currents mediated by brush-YFP (Figure 3—figure supplement 2D,F), indicative of a hyperpolarization-activated Ca2+-permeable channel. Since an N-terminal missense mutation leads to activation of brush, the conserved CNGC.IVA cytoplasmic domain may mediate channel gating (Figure 4A). The expression of brush alone in oocytes induces Ca2+ influx, therefore assembly of a brush homocomplex leads to deregulated activity (Figure 4B). As brush is recessive we speculate that brush is mainly positioned in silent heterotetrameric complexes in the heterozygous state, but assembles into a population of homocomplexes in homozygous plants triggering the phenotype (Figure 4C). Given that brush is expressed in root hairs and nodule primordia after inoculation with rhizobia and that Ca2+ spiking in brush is intact (Maekawa-Yoshikawa et al., 2009), the deregulated Ca2+ influx activity may impair rhizobial infection progression by interfering with downstream signaling events. brush is a rare recessive gain-of-function missense mutation and exhibits an unusual quantitative genetic behavior. We pinpointed the CNGC tetrameric complex in combination with the expanded gene family as the causative factors for the unusual genetics. Although definitive evidence demonstrating that plant CNGCs form tetramers is required, their inclusion in the superfamily of voltage-gated ion channels predicts they will form such complexes. In support of this conclusion, the recent cryo-electron microscopy structures of the TAX-4 CNG channel from Caenorhabditis elegans (Li et al., 2017), the prokaryotic LliK CNG channel from Leptospira licerasiae (James et al., 2017), and the human hyperpolarization-activated cyclic nucleotide-gated (HCN1) channel (Lee and MacKinnon, 2017) all disclose a tetrameric assembly. Therefore, we speculate that quantitative competition amongst redundant subunits for tetramer inclusion clarifies why a BRUSH null is phenotypically wild type and why overexpression is required to suppress the brush phenotype. Model for brush activity in planta. (A) The predicted two-dimensional topology of a brush monomer embedded in a lipid bilayer. (B) Model explaining the mechanistic connection between the relative abundance of the brush mutant channel with the unusual quantitative genetic behavior of the brush phenotype. Based on complementation and interaction studies, BRUSH engages in a tetrameric complex along with 3 other CNGC.IVA proteins. From the segregation analysis, plants heterozygous for brush exhibit a wild-type phenotype. Expression of brush in oocytes mediates leaky Ca2+ influx, indicating that a homotetramer is inappropriately active. (C) Probability-based overview of brush homotetramer formation assuming that each of the 4 CNGC.IVA subunits participates with equal likelihood in complex formation. Shown is a grid containing 8 × 8 tetramers with CNGC.IVA WT (grey dots) and brush (red dots) subunits. Both wild-type and heterozygous plants do not exhibit a phenotype (indicated by green background). The probability of forming brush homotetramer is 1:4096 for a heterozygous and 1:256 for a brush homozygous genotype. A brush homotetramer (shown inside yellow star) is required to trigger the phenotype (red background). This frequency-dependent assembly of the leaky brush tetramer explains the phenotypic differences observed in plants harboring different allele frequencies. Expression of brush in oocytes revealed that the mutation renders the channel permeable to Ca2+ influx under hyperpolarizing conditions. Evidence obtained from Arabidopsis (Gao et al., 2016; Wang et al., 2017; Zhang et al., 2017), Medicago truncatula (Charpentier et al., 2016), and the moss Physcomitrella patens (Finka et al., 2012) CNGCs also supports the inward rectification of Ca2+ by plant CNGCs, while numerous physiological studies have implicated CNGCs as being intimately linked to Ca2+ (Wang et al., 2013; Guo et al., 2010; Chan et al., 2003; Urquhart et al., 2007). Although brush was impermeable to K+ in our assay, evidence exists that some plant CNGCs are permeable to other cations (K+ and Na+) in heterologous systems (Gobert et al., 2006; Ali et al., 2006; Leng et al., 2002; Leng et al., 1999). Collectively, the evidence demonstrates that plant CNGCs inwardly rectify cations. Our results demonstrate that plant CNGC.IVAs may share more in common with metazoan Kv1-Kv4 K+ channels relative to typical mammalian CNGs. Similar to BRUSH, Kv1-Kv4 channel gating and subunit interactions are mediated by an N-terminal T1 domain (Barros et al., 2012; Zagotta et al., 1990). In contrast, human CNGs assemble via C-terminal interactions and are gated by binding of cyclic nucleotides (Barros et al., 2012; Giorgetti et al., 2005). In addition to CNGCs, plants contain a family of shaker-type K+ channels with cyclic nucleotide-binding domains. Similar to BRUSH, these channels are not gated by cyclic nucleotides, but instead are regulated by voltage and relative ion concentrations (Hedrich, 2012). Since plant CNGCs have been difficult to assess in heterologous systems (Ma and Berkowitz, 2011), the discovery that a single residue substitution in a conserved domain is sufficient for activation represents a significant advance towards understanding their regulation. Lotus japonicus Gifu (wild-type, accession B-129) (Handberg and Stougaard, 1992), Miyakojima (accession MG-20) (Kawaguchi et al., 2001) and brush (EMS mutant SL0979-2, Gifu) (Perry et al., 2003) plants were used. The BRUSH TILLING line SL1484-1 was obtained from the L. japonicus TILLING facility (John Innes Centre, Norwich, UK). The seed bag numbers of critical lines are listed in Supplementary file 3. Seeds were scarified with sandpaper, sterilized for 10 min in 4% sodium hypochlorite, and imbibed overnight in sterile water at 4°C. Hairy roots were generated using the Agrobacterium rhizogenes strain AR1193 (Stougaard et al., 1987). Nodulation experiments were carried out by inoculating plants grown in pots or weck jars containing a sand-vermiculite mixture and Fåhraeus (Fahraeus, 1957) media with Mesorhizobium loti MAFF303099 expressing DsRed (Markmann et al., 2008). Transgenic roots were visualized with either a stereomicroscope (Leica M165FC) or confocal laser scanning microscope (Leica SP5). Hairy roots were stained for GUS and sectioned as described previously (Chiasson et al., 2014). Plants were cultivated in growth cabinets at 22°C (16 hr light/8 hr dark). All complementation and GUS experiments were carried out a minimum of three times and displayed similar results. Crossings were performed as described previously (Jiang and Gresshoff, 1997). Primers and plasmids used for all experiments are listed in Supplementary file 1 and Supplementary file 2, respectively. F2 plants from a cross between brush and MG-20 were used for fine mapping using SSR markers as described (Groth et al., 2013). Primer sequences were obtained from the Kazusa DNA Research Institute website (http://www.kazusa.or.jp/lotus/markerdb_index.html). The region was further refined using identified SNPs. The brush target interval between TM2432 and SNP3 (approximately 103 kb) was sequenced by Sanger sequencing. The brush genome was also reassembled after next-generation sequencing to identify mutant-specific polymorphisms. Nuclear DNA (see below) of brush seedlings was subjected to next-generation sequencing at Eurofins MWG, Germany, using an Illumina HiSeq 2000 (Illumina, USA) with a read length of 2 × 100 bp. Genes in the brush target region were annotated after sequencing using Genscan (Burge and Karlin, 1997) and Artemis (Rutherford et al., 2000). CLC Genomics Workbench (CLC bio, Denmark) was used to analyze the sequencing data. Four-week-old brush seedlings were transferred to the dark for 2 days before leaf material was harvested. Approximately 2 g of ground powder was resuspended in 20 ml ice-cold HB buffer (10 mM Tris, 80 mM KCl, 10 mM EDTA, 1 mM spermine, 1 mM spermidine, 0.5 M sucrose, 0.5% triton X-100, 0.15% β-mercaptoethanol, pH 9.4 with NaOH) by gentle shaking on ice. The solution was filtered through two layers of Miracloth (Calbiochem, Merck, Germany). The flow-through was transferred to a 15-ml Falcon tube and the nuclei were pelleted at 4°C by centrifugation (1800 x g) and washed two times by resuspension in HB buffer. The final pellet was resuspended in 500 μl CTAB buffer (55 mM cetyltrimethylammonium bromide, 1.4 M NaCl, 20 mM EDTA, 100 mM Tris, pH 8), and incubated at 60°C for 30 min. 500 μl chloroform:isoamylalcohol (24:1) was added and mixed by inverting the tube several times. After a centrifugation step at 8000 x g (4°C) for 10 min, the upper phase was transferred to a new tube. 5 μl of RNase (10 mg/ml stock concentration) was added and incubated at 37°C for 30 min. 0.6 volumes ice-cold isopropanol was added and mixed by inverting the tube several times. The nuclear DNA was then precipitated at −20°C overnight and centrifuged for 10 min at 16,000 x g and 4°C. The supernatant was discarded and the pellet was washed with 70% ethanol and resuspended in 55 μl TE buffer. Yeast two-hybrid interaction assays were conducted with the haploid yeast strain AH109 (Clontech). Split ubiquitin interaction assays were carried out in the haploid strain THY.AP4 (Obrdlik et al., 2004). THY.AP4 and plasmids for split-ubiquitin were obtained from the Arabidopsis Biological Resource Center (http://abrc.osu.edu/). Plasmids used for both interaction assays are shown in Supplementary file 2. Bait and prey plasmids were introduced via double transformation using the lithium acetate method (Gietz and Schiestl, 2007) and selected on media lacking leucine and tryptophan (-LW). The interacting protein pair of CCaMK and CYCLOPS was used as a control for yeast two-hybrid (Yano et al., 2008). Positive transformants were restreaked on -LW, then used to inoculate overnight cultures in liquid -LW media. Overnight cultures were diluted to OD600 of 0.5 in sterile water and diluted 10-fold. 5 μl was spotted on –LW or solid media lacking leucine, tryptophan, adenine, and histidine (-LWAH). Yeast plates were incubated at 28°C for 3–5 days. All interaction assays were independently conducted a minimum of three times. BRUSH and brush coding sequences were cloned for Xenopus expression with a custom Golden Gate cloning strategy using a modified backbone obtained from the Standard European Vector Architecture 2.0 database (Martinez-Garcia et al., 2015). The backbone (with flanking bacterial transcriptional terminators) was derived from pSEVA191 (http://wwwuser.cnb.csic.es/~seva/) and was chosen to alleviate toxicity issues uncovered while cloning CNGC.IVA sequences into pUC-based Golden Gate backbones and pGEMHE (Liman et al., 1992). A ccdB cassette compatible with Golden Gate cloning (Binder et al., 2014) was amplified and inserted into the AvrII/SacI sites of pSEVA191 to create the LII backbone pSEVA191 1–2. The coding sequences of BRUSH and brush were then combined in a BsaI cut-ligation with modules containing the T7 promoter as well as the 5’UTR and 3’UTR sequences of β-globin mRNA (amplified from pEMHE). The same backbone was used to express the constructs for BiFC analysis, where LI Golden Gate B-C or D-E parts encoding for the N-terminal (VN) or C-terminal (VC) portions of mVenus (Offenborn et al., 2015) were inserted. Plasmids were assembled in a 15 µl reaction containing 100 ng of each LI plasmid and backbone, 1.5 µl CutSmart buffer (NEB, Germany), 1.5 µl 10 mM ATP, 0.75 µl BsaI (NEB), 0.75 µl T4 ligase (NEB). The reaction was then cycled 6 times (10 min at 37°C, 10 min 16°C) in a PCR machine, followed by incubation at 37°C (10 min) and 65°C (20 min). Capped RNA (cRNA) synthesis, oocyte injection, and voltage-clamp recordings were performed as described (Becker et al., 2004; Müller-Röber et al., 1995). cRNA was synthesized with a mMESSAGE mMACHINE T7 Transcription Kit (ThermoFisher, Germany) and oocytes were injected (General Valve Picospritzer III, Parker Hannifin Corp.) with approximately 25 ng cRNA or with RNase-free water as a control. Injected oocytes were stored at 18°C in ND96 solution (96 mM NaCl, 2 mM KCl, 1 mM CaCl2, 1 mM MgCl2, 5 mM HEPES, 10 mM sorbitol, pH 7.4 with NaOH) adjusted to 220 mOsm/L with sorbitol and supplemented with 25 µg/ml gentamycin until use. Measurements were recorded 2 to 3 days after injection using the two-electrode voltage-clamp technique with a Turbo Tec-10Cx amplifier (NPI electronic GmbH). During two-electrode voltage clamp measurements, oocytes were constantly perfused with bath solution composed of 30 mM CaCl2, 10 mM MES-Tris pH 7.4, adjusted to 220 mOsm/L with mannitol and supplemented with either 100 µM 8-Bromo-cAMP (Sigma) or 100 µM 8-CPT-cAMP (BioLog). For analysis of channel permeabilities, CaCl2 was exchanged as indicated in the figure legends with 5 mM CaCl2, 15 mM CaCl2, or 60 mM KCl. Starting from a holding potential of −40 mV, voltage steps from +60 to −160 mV in 20 mV increments were applied (PatchMaster, HEKA Electronics Inc.). For localization, YFP was fused to the C-terminus of BRUSH or brush. Oocytes were imaged by confocal microscopy 2 to 3 days after injection with BRUSH-YFP and brush-YFP cRNA (Leica TCS SP5, excitation: 488 nm, detection: 525–575 nm) to confirm expression. The same protocol was used for BiFC experiments, except that cRNAs were mixed 1:1 prior to injection. For analysis of gene expression after rhizobial inoculation, Lotus japonicus Gifu seeds were germinated and grown on half-strength B5 agar plates for 14 days. Six plants were planted per weck jar containing sand/vermiculite with Fåhraeus media. After 7 days, root tissue from a single jar was collected and pooled (represents a biological replicate) for the Day 0 time point. Mesorhizobium loti MAFF303099 expressing DsRed was added to the remaining jars and tissue was collected in the same manner after 12 days. To analyze gene expression after RNAi, positive hairy roots were isolated from individual plants 6 weeks after inoculation with Mesorhizobium loti MAFF303099 DsRed. For both experiments, root tissue was ground in liquid nitrogen and RNA was extracted with a Spectrum Plant Total RNA Kit (Sigma). Genomic DNA was removed using a Turbo DNA-free Kit (Ambion) and total RNA (1 μg for the time course and 200 ng for RNAi) was used for cDNA synthesis with Superscript III (ThermoFisher). cDNA was then checked for genomic DNA contamination by PCR. Expression of CNGC.IVA cluster genes after rhizobia inoculation was analyzed by qPCR using SYBR Select Master Mix (Applied Biosystems) with a CFX96 real-time PCR machine. brush expression after RNAi was analyzed by qPCR using mi-real-time EvaGreen Master Mix (Metabion) with a QuantStudio 5 Real-Time PCR System (ThermoFisher). In both cases, the plotted data point for each biological replicate represents the mean of three technical replicates. The relative expression was calculated with the 2-ΔΔCT method (Schmittgen and Livak, 2008) using eEF-1Aα (GenBank: BP045727) as the reference. Arabidopsis thaliana protein sequences were obtained from The Arabidopsis Information Resource (TAIR). A multiple sequence alignment was generated using MUSCLE in CLC Main Workbench (CLC bio, Denmark). A Maximum Likelihood phylogenetic tree was calculated using UPGMA (100 bootstrap iterations were performed). One-way ANOVA statistical analysis of data followed by a post-hoc Tukey’s multiple comparisons test and t-tests were calculated using GraphPad Prism. Journal of Experimental Botany 57:125–138. Journal of Molecular Biology 268:78–94. Journal of Experimental Botany 57:791–800. Molecular Genetics and Genomics : MGG 266:157–166. 93–110, Cyclic nucleotide gated channels (CNGCs) and the generation of Ca2+ signals, Coding and Decoding of Calcium Signals in Plants, Springer. MGG Molecular & General Genetics 207:251–255. Thank you for submitting your article "A quantitative hypermorphic CNGC allele confers ectopic calcium flux and impairs cellular development" for consideration by eLife. Your article has been favorably evaluated by Christian Hardtke (Senior Editor) and three reviewers, one of whom is a member of our Board of Reviewing Editors. The reviewers have opted to remain anonymous. The manuscript provides new insight into CNGC channels in plants through analysis of an unusual hypomorphic allele of BRUSH, a CNGC channel from L. japonicus that is required for nodulation. The strength of the work is the elegant resolution of the genetic riddle of this hypermorphic allele and the identification of a missense mutation in a conserved N-terminal region of the protein which appears to result in a constitutively-open channel. The data are explained by a model involving a tetrameric complex of Brush monomers and suggests assembly and gating properties more similar to those of voltage-gated K+ channels rather than the classical animal CNGC channels. There is still much that is unknown about CNGC channels in plants and the reviewers agree that the discovery of a residue that results in constitutive activation represents a significant advance towards understanding their regulation. However, they feel that two aspects of the data need to be further substantiated. The protein interaction data need to be strengthened. As noted below, the yeast 2 hybrid experiments are missing some controls and furthermore, the interactions are based only on the yeast 2 hybrid data. The yeast 2 hybrid data need to be improved and the subunit interactions need to be confirmed in a second system. For example, can BRUSH and brush interactions be observed in oocytes (by FRET or other protein-protein interaction approaches). Does Brush run as a multimeric complex on gels? Specific concerns about the yeast 2 hybrid data. The current yeast 2 hybrid data are missing some negative and positive controls. The empty vector control indicates that there is no self-activation but there are no controls with proteins that do not bind (something is needed to demonstrate specificity of binding i.e. another negative control protein that does not bind to the CNGCs). Additionally, does brush interact with itself? This is not shown in the current data and needs to be demonstrated as it is essential for the model. 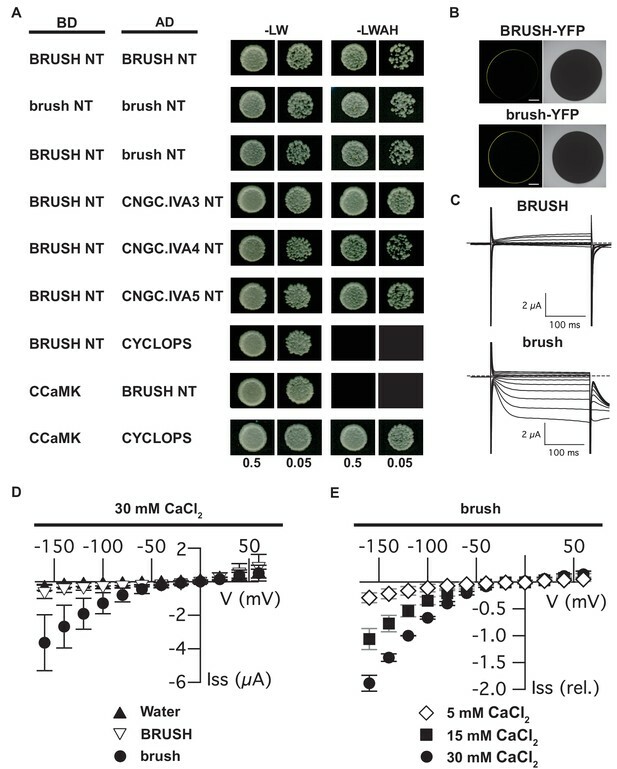 It is proposed that a deregulated calcium influx impairing infection is suggested to explain the brush nodulation phenotype. There are robust calcium sensors that could be used to document this effect directly. Comparative measurements of calcium influx in root hairs of brush mutants and wild type root hairs are needed to provide in planta evidence to support the proposed model. We have addressed the concerns regarding the yeast two-hybrid controls by including CCaMK and CYCLOPS from Lotus japonicus. CCaMK and CYCLOPS interacted in the yeast two-hybrid system while neither protein interacted with the N-terminal domain of the tested CNGCs. The results have been added to Figure 3A. Yes, the N-terminus of the brush mutant does maintain the self-interaction and this result has also been added to Figure 3A. This work was supported by funding from European Research Council (MP; Project No:340904), Deutsche Forschungsgemeinschaft (MP, PD; Forschergruppe 964), and the Alexander von Humboldt Foundation (DC). We would like to thank C Korbmacher (FAU Erlangen) for providing Xenopus laevis oocytes, Gudrun Steingräber (FAU Erlangen) for cRNA synthesis, and Christopher Grefen (University of Tübingen) for advice regarding the split-ubiquitin system. © 2017, Chiasson et al.